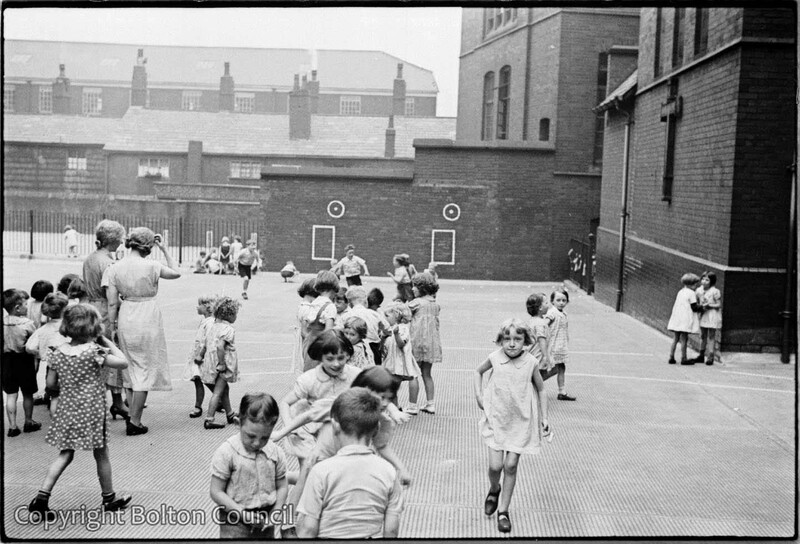 Children in the playground of St Peter and St Paul Primary School, Pilkington Road. The school is still open, and the cross remains on the wall of the playground. Born in 1948, I used to go to SS Peter and Paul. We lived at 44 Fletcher St. til about 1954-5 -ish in the row of houses backing on to the playground. Hello Bill , I was wondering if you would know the year of this Photograph? Also my friend Marjorie Moran wonders if you would know her Late husband Tony Moran ? In an earlier website I had seen this original Spenders Worktown image dated as 1935. I was at this school from 1951 to 1956 then was transferred to English Martyrs. But my days in these two playgrounds and of course the church were priceless. The far playground was boy’s only and the near was girls only, in my days. The church used to be packed every mass. In the ’90’s I attended mass on a visit from America. And I was visiting my old churches. And that St. Mary’s was gone. Then they showed me the Crucifix that hung for all it’s years over St. Mary’s altar. It had been given to the custody of SS. Peter & Paul. I was thrilled to get to touch the very Cross that I knew in my childhood living in Back Haydock Street. Then one of the women at Sts. Peter and Paul said she had something to show me, and possibly I could tell her what it is she found. She went down into the basement and brought back a piece of Marble about 10″ long by 4″ wide and 5/8″ thick. I was blown away. She had found it hidden in the wall between floor beams. It was the reliquary that someone spirited away after the altar fire. There was a 1″ square insert of marble specially fitted and sealed to perfectly match the existing marble grain. Hardly visible due to the blackening from smoke contact. I guess in the fire. Someone must have planned on coming back to purloin the item. Yes my friends they were the Saints bone fragments that are buried under every Catholic Altar. These bones were of Saint Peter and Saint Paul and for a brief moment in my hands. I choked up and thought, Oh my God, how fortunate I am to be given this honor. The years I attended this school and this church masses, as a wee lad, the church where I was confirmed by the Bishop of Salford, at that very altar would years later be reduced to ashes, that years later living in America I would return and on the very day the reliquary of Sts. Peter and Paul would be in my hands.